Family Matters Reviewed | Every Episode Hilariously Reviewed, in Chronological Order. Every Episode Hilariously Reviewed, in Chronological Order. 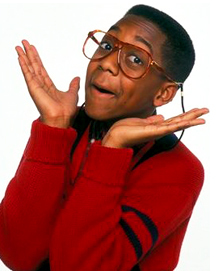 In the hearts & minds of Steven Q. Urkel & Family Matters fans, I mean. And, for a while, in My Reviews @: Family Matters Reviewed! You’ll find Reviews of the 1st 3 Seasons (in chronological order) at the site above. Sadly, writing gigs that paid real, actual dollars – which could be exchanged for things like electricity & weed – were being passed up so I could praise The Urk-man, make light of Future Judy’s dong-filled career and lust after Sweet, Hella-fine, delicious (I assume) Telma Hopkins.